- The 25 km/h speed limitation of the Bosch drive system is completely lifted. - The E Bike display shows the correct values – even when the tuning is activated. - Comfortable activation at any time via the WALK button (alternatively via smartphone app). - The original condition of the E Bike can be restored without problems. - Save your own tours, compare them with friends and track your performance. - Tuning activation via app possible (alternatively also via WALK button). - Tuning option can be "hidden": In this case the tuning can no longer be activated via the WALK button, but only with the app. - Motor lock: The app enables you to temporarily switch off the E Bike motor. This allows you to protect your E Bike from unauthorized access. 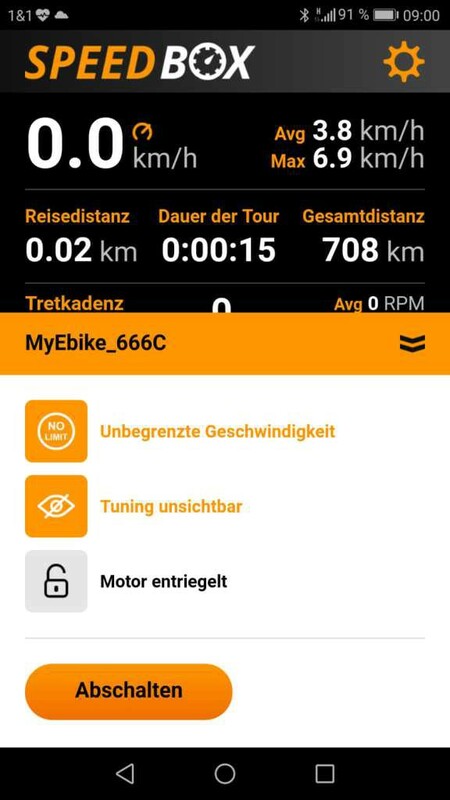 - Exact display of ride data on the smartphone display - since the displayed data comes directly from the control unit of the electric bike, there are no deviations as they are known from many sports apps. 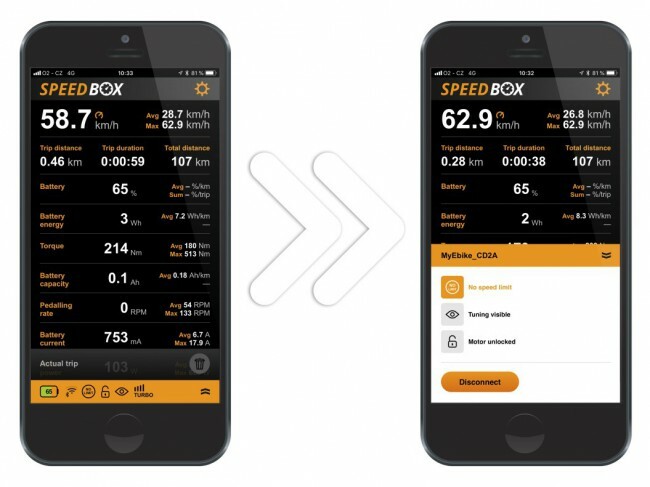 The connection between smartphone and SpeedBox takes places wirelessly via Bluetooth (4.0 or higher). 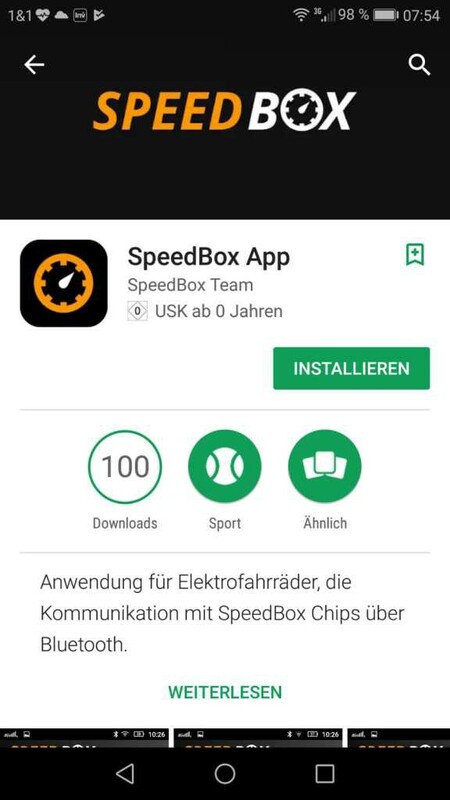 According to the SpeedBox manufacturers, the app will be continuously updated and equipped with additional functions. The updates are fully automatic and are free of charge. Important hint: Of course you can also use your electric bike and SpeedBox B-Tuning without a smartphone - in this case simply activate the tool with the WALK button. Installing this tuning tool is as easy as you know it from the previous SpeedBox versions. The plugs of the tool simply have to be connected to the E Bike. Since only colour-coded original plugs are used, even absolute technical laymen should have no problems with it. De-installation is just as easy. 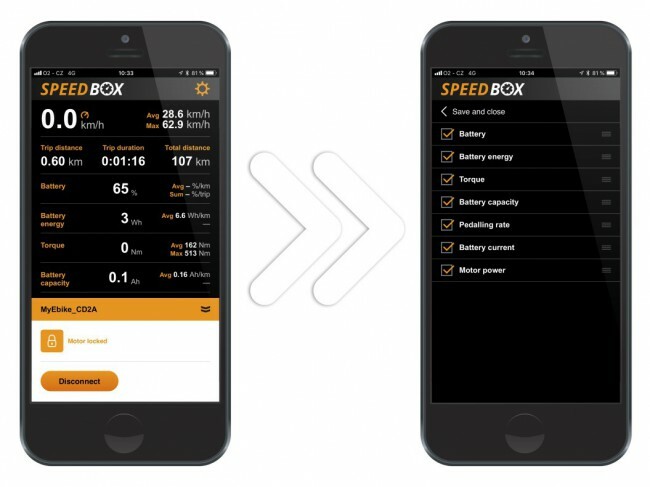 After installing the SpeedBox you can switch on the tuning at any time by briefly pressing the WALK button. To confirm that the tuning is active and the speed limit has been removed, the display briefly shows 9.9 km/h (=theoretical engine support up to 99 km/h). To disable tuning, simply press the WALK button again. Now a speed of 2.5 km/h is briefly displayed - this signals that the tuning has been cancelled and the motor support stops at 25 km/h again. - Bosch E Bike drive systems (Active, Performance & CX Line). - INTUVIA, NYON, PURION or KIOX displays. - You need Bluetooth 4.0 or higher to use the smartphone app.